"Withnell and Murphy provide a structured and comprehensive resource to the mental health professional who seeks practical strategies that will empower families to engage with challenging issues, maintain the balance between stress management and recovery and build the foundations of lasting relationships." "Family Interventions in Mental Health Nursing is an essential addition to a growing body of literature ... The authors' consideration of the barriers to implementation in contemporary practice will ... provide points of clarity in the search for solutions. This scholarly yet highly accessible book will appeal to a wide variety of practitioners from those at the very beginning of their careers to those experienced in delivering or teaching family interventions on a day to day basis." It is rare that people live in the absence of family, friends or other social support networks, so working with families and staging effective family interventions is an important and logical aspect of promoting recovery in mental health nursing. This book is a comprehensive and accessible guide that will help you to incorporate families more fully into the care of individuals with mental health needs. The authors carefully introduce the concept of family interventions before going on to demonstrate its practical application, offering examples from practice and also potential barriers to implementation. 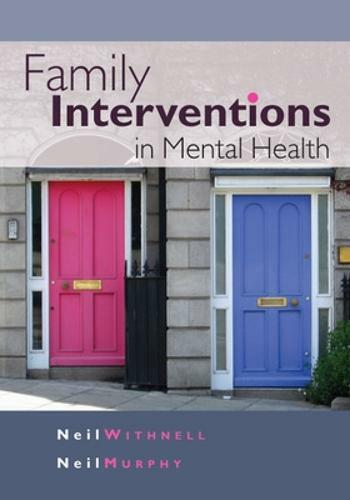 Case studies of real family workExamples and practical tools to use in practiceAims and learning outcomes for each chapterQuestions at the end of each chapter to enhance self assessment and reflectionFamily Interventions in Mental Health will be an invaluable tool for both mental health students and qualified practitioners. It will also be relevant to social workers and occupational therapists working in mental health settings or the community.